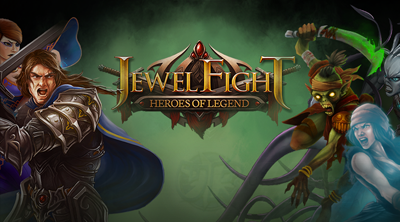 Jewel Fight: Heroes of Legend is an action RPG puzzle game presented by BANDAI NAMCO Games. Available on Android - Google Play and iOS - App Store. Explore the massive game world of Wildmoon and uncover untold special event locations. Fight epic battles against bloodthirsty enemies and elemental creatures using your lethal skills, perform puzzle combos, and unleash devastating spells to protect your town! - If you need a quick HP restore after a fierce fight, go to the 3rd Stage (vs Ukobuth Raider). - Once you enter the battle, tap Pause (lower right corner), then select exit to Map. - Voila!, you now have a full HP bar, go on and continue your game. - Note: Not available during tutorials, you need to complete the tutorial and unlock the Arena first. - Note: It looks like the tutorial for the stage will disappear once you reach late game, for me it was after I completed the "Amulet" and after losing to "Moltenheart". - Simply advance the time of your device, then go back to the game. - Example: 25,000 HP will take about 7 hours, so advance your current time to +7 hours, or until you have full HP. - Advance the game, newly completed stages will reward you with nice XP. - Play Forgotten Arena, XP is based from your current Lvl. - The maximum Lvl is 25. - Dissolve 5 Gems of the same type to deal a DoT damage to your enemy. - If you will move any Gem and it didn't dissolve anything, all skills of your enemy will get a little charge, so be careful. - If the battle is too hard for your character, try to buy better items. Change your skills according to your needs, or to counter your enemy's skills set. The Arena is also a nice grinding place, level up your character there. - Conserve your Health Potions, use it for the final battle versus Ash'eon. - Only upgrade your late game or final items. - Tap & Hold skills during battle to view more info about them. - Equip 1 Offensive Skill and 2 Tactical Skills, it's kinda better. - Sometimes, it is better to save up your Tactical Skills for destroying Marked Gems. - Once you have completed the Amulet late game, start adding more Critical Chance % to your Stats, to activate this more often (still optional though, depends on your class). It will fully charge your Skills and transforms some Gems to Special Gems, use it wisely. - It is wise to fully charge your amulet first before a fierce battle (might need higher Critical Chance %). - Create a new character (Warrior for high HP) using some of your Crystals, play the tutorial stages until you complete the 4th stage. - The game will then redirect you to the Market section, DO NOT buy the dagger or upgrade the Potion, instead, just tap on your character portrait at the lower right corner then delete that character. This way, your Gold and Crystals will not be used for that tutorial! If you didn't work, you can also exit the game after you reach the Market tutorial. Go back and you'll get all Gold and Crystals, unspent! - You can easily get 1,300 Gold and 25 Crystals per run here, plus the fights are quick and easy. - Just create, farm, delete, then create another character, repeat steps. If you want to continue, follow Method 1B below. - Continue using the character above to gather Gold and Crystals, then delete them once the game gets too hard, repeat steps. - Note: Do not buy or upgrade anything, just feed all farmed Gold or Crystals to your Main Character. If you want to continue and buy some skills and items for this character, you may do so. - Doing high combos during battle will generate some bonus Gold too. - If you just want to get Gold, you can exchange your farmed Crystals for Gold from the Market > Treasury. I recommend the "Chest of Gold" 200 Crystals for 30,000 Gold. - Note: This trick might not be available anymore if the game is patched hehe. 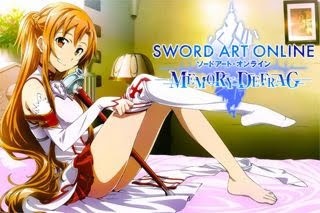 - Gets Health and Defense % bonuses (Lvl based). - Offensive skills will take 3 turns to attack. - Exclusive Tactical Skill: Power Strike (Swipe the board to destroy a row column) A nice skill for destroying marked gems, but limited only for straight lines. - Suggested Build: HP, Damage and Defense (or replace some Defense or HP with Crit late game). - Gets Attack Damage bonus (Lvl based). - Offensive skills will take 3 or 4 turns to attack. - Exclusive Tactical Skill: Chain Lightning (mark 3 Gems to activate the Chain Lightning skill) A nice skill for destroying marked gems, note that it will only destroy Gems along the lines of the formed triangle. Yup, it won't destroy Gems inside the triangle. - Suggested Build: HP, Damage and Defense (or replace some Defense with Crit late game). - Gets Critical Chance % bonus (Lvl based). - Offensive skills will only take 2 turns to attack. - Exclusive Tactical Skill: Killing Spree (mark as many stones as you can to destroy them!) This one is very useful for destroying multiple marked, or unwanted gems. Very flexible so I recommend this one. - Dissolve the Gems needed to charge up your skills, when fully charged, tap on them to activate. Note that dissolving certain Gems might also charge the skill bars of your enemy. - This is where you will be doing a lot of adjustments according to your enemy's skills set. - It's ok to get all 3, it's cheap anyway and you'll need them all. - Select an Offensive skill with at least 1 Gem that your enemy isn't using, but if you enemy has all 4 default Gems, use any that you think is best. - Dissolve Gems needed to charge up your offensive skill, focus more on firing this one. - Ignore any info about them, all Defensive skills will only increase the counter/s marked by your opponent, that's it. - What Are Marked Gems? - If Marked Gems reaches a zero counter, it will explode and deal moderate to massive damage to your HP next turn, so dissolve them quickly or use your Tactical Skills to get rid of them. - In my opinion, it is better to replace your Defensive Skill with a Tactical Skill asap, preferably a Tactical Skill that can destroy Gems. Yes, it better to destroy them rather than extending their time, because some marked Gems are impossible to dissolve. - There are several types of "Marked Gems" that enemies can conjure, tap and hold on skills to see their info. - Support Skills that can modify the board, this skills will greatly affect your winning chances. - Meteor, Volcano, and Crow Swarm are also ok.
- Exclusive Tactical Skills are also good, especially the one used by Rogues. - Tap and hold on the skill to learn the requirement, example: Mage's Chain Lightning skill. You need to select 3 Gems forming a triangle to trigger the skill. - Skills that will automatically count down, upon activation, example: Rogue's Killing Spree skill. Once you activate this skill, mark as many Gems that you want to be destroyed, you only have a few seconds to do this. - I hope you saved your Health Potions from the start of the game, because you'll need some of them to survive 3 long battles. Yes, Ash'eon will revive 3 times! - Max your character's Lvl. - Buy and upgrade your final items, see example pic below for my Rogue stats and items, not fully upgraded though hehe. 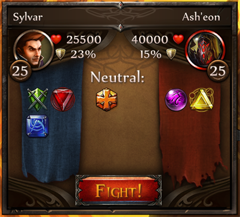 - Choose your skills wisely, Ash'eon will use Dark/Light Gems first, then he will switch to Dark/Light/Red later on. Green and Blue (Red is also ok) are the best Gems to use against him. 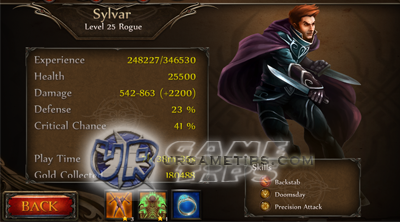 - Check sample screenshot for my Rogue skill selection below. - Skills Used Above: Backstab, Precision Attack, Doomsday. - Backstab, Killing Spree, and Precision Attack is also ok.
- Ash'eon will also buff his attack damages during battle, so you also need to move faster. - Try to dissolve all Gems marked by him to avoid massive damages. - Charge up your Amulet first, before entering the battle (might need higher Critical Chance %). Use it to recharge your Tactical Skills, and help eliminate all marked Gems. - If you reached this point of the game, then you should know how to use the above info and fight by now, good luck!